Originally from the Limousin region, clafouti, or clafoutis in French, is now a popular dessert throughout France. The name comes from the word ‘clafotis’, which means to ‘fill up’ in Occitan. Traditionally it is made with cherries, but it works well with any fruit or berry. There are many benefits to adding cinnamon to a dish: it controls blood-sugar levels, helping those with insulin resistance and and pre-diabetic conditions and also aiding weight loss. Added to this, it has significant antioxidant and anti-inflammatory properties, making it an excellent choice for sufferers of arthritis and IBS. Preheat the oven to 180°C. Melt the butter in a deep frying pan and fry the apples for about five minutes on a low heat. Add the cinnamon and the honey and heat for another couple of minutes, stirring gently. Butter a gratin dish and add the apple mixture. Put the flour, eggs and sugar in a bowl and mix, adding the milk and cream to the mixture a little at a time, beating well. Pour the mixture over the apples in the dish and bake for 35 to 40 minutes until golden brown. 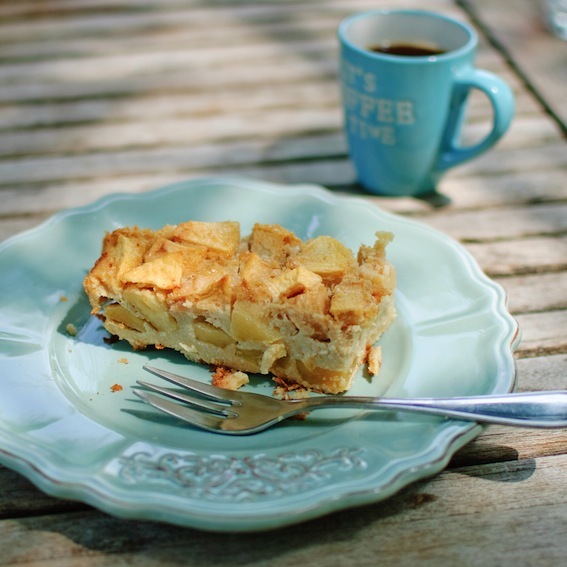 This entry was posted in French, Nutritional information, Sweet and tagged apple clafoutis, apple dessert with honey, benefits of cinnamon, cinnamon, clafouti, clafoutis, traditional French dessert. Bookmark the permalink. Oh and don ‘t forget that mud makes for a nice skin treatment- I am sure that Hugo has that as an alterior motive for his romping. I love that cinnamon is so healthy (because I sure love to ad it to my food). I forwarded this to my Dad who goes have diabetes. I love cinnamon, and I try to use it as much as I can, but just for its taste. I didn’t know that it has so many healthy properties, what a great news! Thanks a lot for all these informations, I’m going to use cinnamon even more often! Love you clafoutis! Thank you and yes, cinnamon is one of the ‘stars’ of the spice rack! Hahaha I always love hearing about Hugo’s shenanigans. Beautiful clafouti. Thank you Mary Frances! And yes he’s always up to something is Hugo! That Hugo, he’s such a character but he is very smart, mud is good for the skin, some people pay for pricy mud facials and body wraps. Your Hugo is on to something. The clafoutis is lovely and the cinnamon is a great addition not just for health reasons but because it tastes so delicious. Maybe he’s going to put a patent on his procedure and sell it to other dogs? You’re right – I love the warm taste of cinnamon. I even add it to savoury dishes. I try to use cinnamon as much as possible. I say try as I often forget to sprinkle it onto something I am cooking. Your clafoutis looks and sounds delicious. Thank you and keep sprinkling! My terrier would be running in the opposite direction from that mud as fast as her legs could carry her. Oh to have a dog that wasn’t pathologically obsessed with all things filthy!